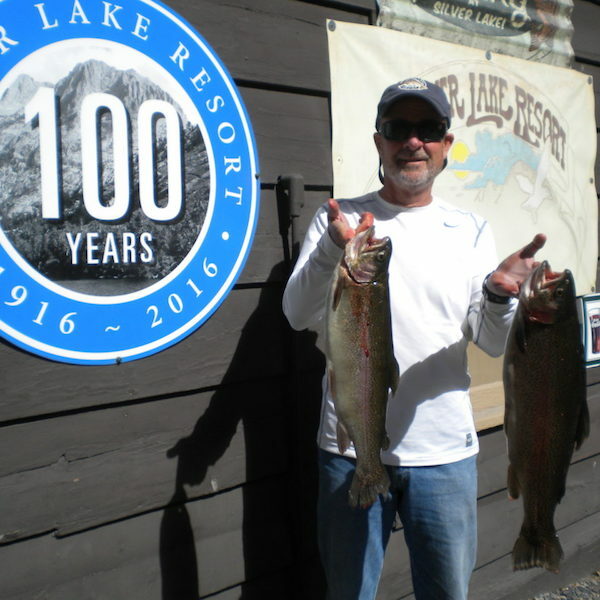 Marc Beck of Garden Grove hooked into these beautiful Rainbows fishing from his float tube weighing in at 6 pound 1 oz and 4 pound 8 oz. using his Fire Tiger Rapala. Great Catch Marc!! I don’t know if how many different ways I can say it or show you with all the great pictures we have, but the fishing here at Silver Lake has been incredible the past two weeks. 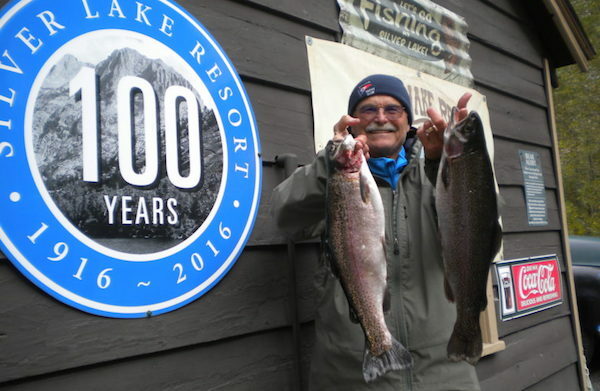 Largely due to the fact that we have stocked 800 pounds of Desert Springs Rainbows weighing in at an average of 4 pounds per fish over the past three weeks, with a load put in last night (Friday). These Desert Springs Brutes are beautiful, fun to catch and worth any fishermen’s story while sitting around the camp fire. 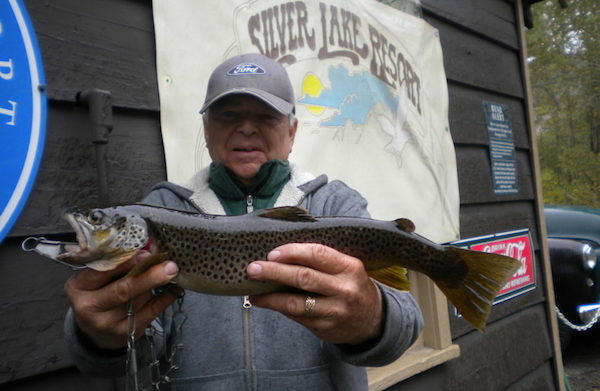 While DFW still hasn’t stocked since the first of September, we have tried hard to continue to provide some of the best fishing in the Eastern Sierra by stocking more of the private Desert Springs Rainbows. These big boys have not been picky on what they like, as we have seen all types of baits, lures, and flies being successful here all week. You will have to put more then a half hour in on the lake to catch fish still, as they won’t jump into your boat. So, slow down, pay attention to how you rig and what you are rigging and you should, but not guaranteed, to be successful. Berkley products still are hot with Dough Baits like Rainbow Glitter Garlic, Mice Tails, Pinch Crawlers, Salmon Peach have all seen some great success. As has lures with some pinks, reds, oranges and yellows in them. Trolling a Dodger with a worm or a Rapala and even a Rainbow Hornberg have all done well. 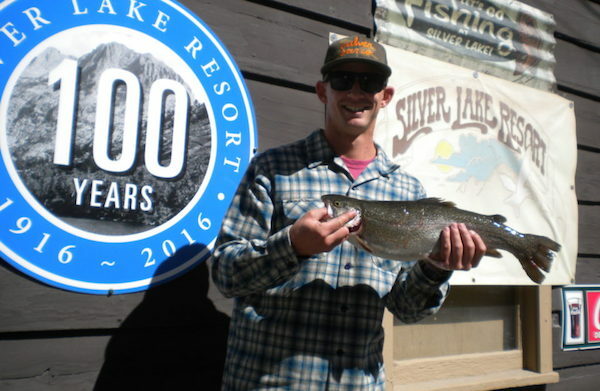 We are winding down here at Silver Lake Resort with only a week to go in the 2018 season, so don’t stall and make sure to get up here one more time to enjoy a great Breakfast or Lunch in our Cafe, rent a boat to either enjoy the beauty of Carson Peak or put a line in to try to catch some fish. 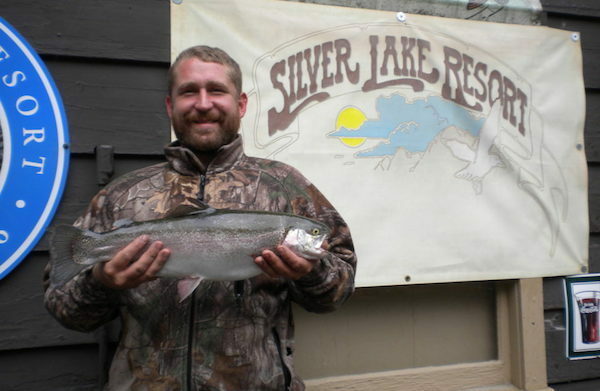 The weather is starting to change and get colder, so layer up and come enjoy a few more days of Silver Lake Resort.